I had such an amazing weekend. Before I tell you all about it and introduce you to Karl Winkler, let me tell you a little story. Our little one will only listen to classical music. This began when he was about four months old. His dad played him a piece from Mozart and he was hooked. He usually listens to Mozart and Strauss, at times other composers with complex classical music, and has a special love for the sound of the violin. Through my son, I am falling more in love with classical music, which is how I discovered the beauty of the Bolero. It’s repetitive nature is so soothing. Although classical music, dance, painting, drawing, sculpting or crafts may not be your thing, you can still find a certain level of interest, imagination and fascination in any of these areas. This brings me to what my post is about, my love for Art. Who Is Karl Winkler And What Is A Vernissage? On Saturday, we attended a vernissage in a town called Krems an der Donau, which is home to Austria’s smallest gallery “Klein Amsterdam” (Little Amsterdam). From August 5 – September 2 the gallery is featuring paintings by Austrian painter Karl Winkler. This is the third time we have attended an event featuring his amazing paintings and work. In case you are not familiar with the terminology, a vernissage is a term used for a preview of an art exhibition, which may be private, before the formal opening. As we live in an increasingly diverse society, it is important to recognize the choices an artist makes in their work. Doing so will help us understand the artist’s interpretation of reality or gain insight into their thoughts and imagination. 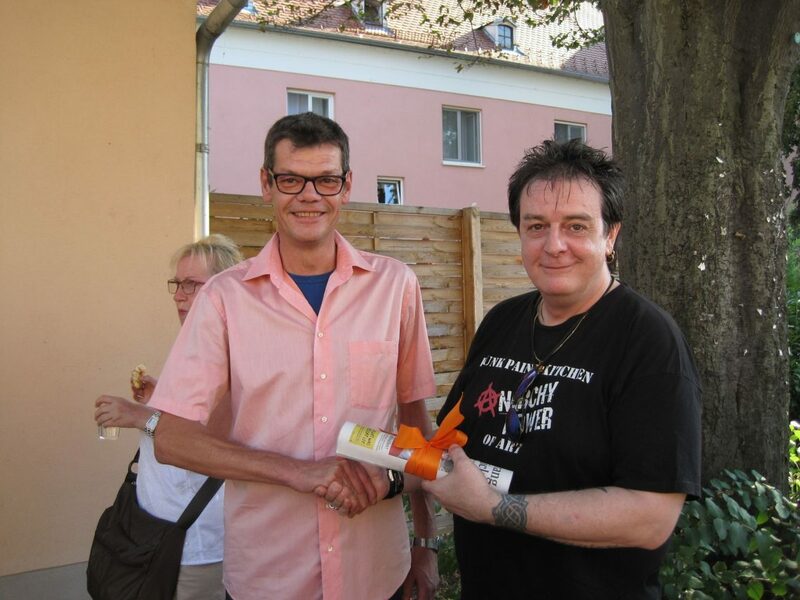 Karl Winkler is an Austrian painter from Wiener Neustadt who also runs the Facebook group and page, Punk Paint Kitchen. Karl describes himself as a punk in his mind, a rock ‘n roller at heart, and in his soul, a painter. Der Bruchteil einer Millisekunde eines Traums – The fraction of a millisecond of a dream. I love attending art exhibitions and vernissages because art must be experienced in person is to truly get a sense of its magnitude. Seeing how a work of art hangs or is displayed next to or near other works of art gives you a better perspective to interpret art in your own way. The evening was great. Karl showcased 11 paintings in total. 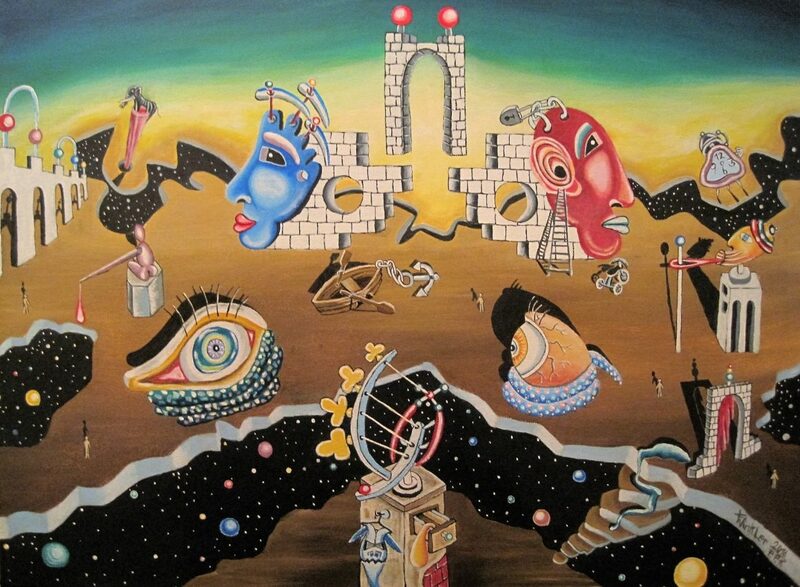 His work is inspired and influenced by the famous Salvador Dali, a prominent Spanish surrealist painter. Dali’s eccentric nature made him the most prominent representative of the Surrealist movement. “The Persistence of Memory” is his most famous work. The fatal sin of human touch. If you open yourself up to art, you allow a world of creativity to transform you as a human being. I’m not kidding. Art can make you smarter, sharper, freer, more tolerant and creative. I encourage anyone to visit a gallery or even a museum if you can find the time. You’ll see how your thoughts and perspectives may change. Unfortunately, nowadays, many schools worldwide lack a high volume of arts education, therefore many kids do not have the opportunity to bring out their creative side. Artwork is a form of both creativity and therapy. Luckily, as we live in Vienna, known as the “city of music”, the arts is not an issue. A way of expressing your individuality without the use of words. Different forms of art can be used to help people understand that they don’t have to accept everything that is around them as fact. Also, it helps us to see things differently, opening their mind to another perspective. Painting is an individual activity in which you enter your own world, a world full of possibilities. Your creative mind allows you to positively isolate from reality and express yourself on your easel. Painters can immerse themselves into hours and hours of strong concentration, removing themselves from their surroundings. It is almost like entering another dimension without leaving our body. Each one of these paintings are available for purchase and can be shipped worldwide. We have two of his paintings in our home. Paranoid tree house with view. Are ready to unleash your own creative juices? Being around art and in the company of creative people makes YOU more creative. Art makes us more human; it helps us to communicate in a different, personal language. I hope you enjoyed Karl’s artwork and could find a story in any one of his paintings. To see more of Karl’s work and show support, you can visit his page Punk Paint Kitchen. Don’t worry that the page is in German, all posts have a translation button to read the text in English. Do you paint, do pottery, dance, or any other form of art? Which one of Karl’s paintings stood out for you and why? I am sure he would be delighted to read your feedback. It’s so nice that your so has an ear for classical music. Fine tastes can be developed so early in life. Amazing Art pieces, full of wonder. 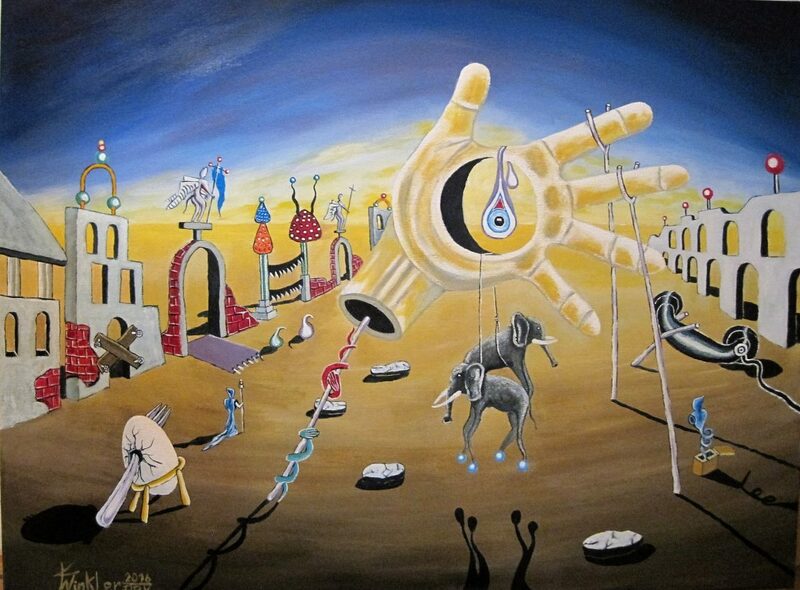 I love surrealist art, I can get lost in it for hours. It’s like staring into a dream. Thanks for sharing this artist. i love these paintings, i used to paint myself but i stopped. i wish i had more time to attend galleries, and exhibitions. There are so many on london. I believe that painting can be very therapeutic! I wish I could paint. If painting is something you love, make some time for it.It is a good way for releasing feelings and building positive energy. xoxox S.
You are so right about art being such a personal experience. I love that you went to a small one– sometimes those are the best! The Karl Winkler is such a great, creative, artistic and talented painter. All his paintings are so impressive and awesome as well. I love painting , I’m living in one village in Ubud , Bali . Known as a center of art and live many world painter artist . I was intrigued by the punk paint kitchen painting! Its inspiring work! Thanks for sharing! I attended an event for art appreciation just last month. They featured different types of art from different artists. The great thing about art is that the viewer can freely interpret the art work which also helps him to process his thoughts and come up with his own realizations and understanding. Doing this greatly helps a person to get to know more about himself and his surroundings. I have never been a part of a vernissage before. All these paintings are so beautiful, they have a very distinct character. Thanks you for sharing these. The photos are really cool. I appreciate and love painting, although I don’t know how to do it myself. I love the richness of the colors and how they are combined and mixed in a way that brings out whatever is desired by the artist. I think it is difficult, and I’m just simply in awe. What an great artwork! The kark Winker art ia quite splendid. I Like all the artwork, It’s very creative and artistic. The paintings are so great!! Thank you for sharing. Your article is very creative and inspiring. I’m starting to think about traveling to Australia in the future. The Karl Winklers art style is quite impressive. I loved all of these pictures and liked that you too have explained the art terms in the post. Thanks for sharing this. I was struck by how much these reminded me of Dali at first, so it was no surprise that he is cited as an influence. But they are more than merely copies, they carry on themes and motifs that signify like minds pursuing the same ends! I love art museums, and in this college town, I have been fortunate enough to visit the university museum and gotten into good discussions with curators about art interpretation. I guess my own artistic leanings manifest themselves in my growing (I hope) abilities at photography. Wow! Thanks for sharing such an insightful post. I like that you provided descriptions of terms for those of us who are not too familiar with art speak. I enjoyed reading it all. Art can make you smarter, sharper, freer, more tolerant and creative.” Agree. It is so true. I am a great fan of creativity and everything related to it. The paintings look great. Thanks for sharing. I think that first one really stands out to me the most. It’s like an unresolved argument, you can feel the tension looking at it. Gonna have to check out both this town and gallery soon, I love any reason to go to Austria! Woah, great work. I think the first one stands out for me the most. It’s like an unresolved argument, you can see and feel the tension in the painting. Will definitely have to check out this town and gallery soon! I always love having a reason to swing down to Austria. I love visiting galleries. You’re so lucky to have seen a good exhibit 🙂 What a lovely art — satisfying to the eyes. I want to disagree with that nowadays many schools lack education as you mentioned. You’re wrong in our schools division from elementary to secondary schools art education is being taught. It’s integrated in the subject MAPEH which stands for music, arts, physical education, & health. Art education couldn’t be neglected or be taught to the students. It’s a part of their school curriculum. I miss the word art. Why you mentioned world wide? This means our country is included and also you said all countries. I want to correct you that our country is offering art education. I think I made myself clear. Again Gil, you are only reading what you want to read. As I said, “many schools worldwide”, not all schools worldwide. You do not need to correct me, as the statement I made is correct that many schools do not offer art education. I have now made myself very clear. If you don’t understand it, please re-read it. Or maybe someone else can explain it to you. These paintings are all so cool! Love the stunning colors and interesting technique! It’s awesome that your kids enjoy arts and classical music. I love attending art exhibitions too. Dear Sheri, I am overwhelmed by the amount of posts and then even more so positive … my words! I thank the users for so many beautiful and constructive words, because I am always happy when people like my painting !!! I would also like to thank you again for this post, it is really great! Thank you, thank you and thank you, …. Firstly, I think it’s great that your children are into this stuff. Secondly, this art – reminds me of the late Peter Max…. Wow, I like his style. Well I do painting in the past in fact I even did one exhibit. Its just that I got so busy and since it would take sometime be known as an artist. Outstanding painting by Karl .The pictures are almost breathing .Learned a new word .Vernissage! Loved reading this post .Very refreshing. I think it’s nice that at an early age, your son is already exposed to the many wonders of the art world. Also, love how the paintings are so thought-provoking with its imagery and leaves the viewers with a different perspective. I love art exhibitions as well! 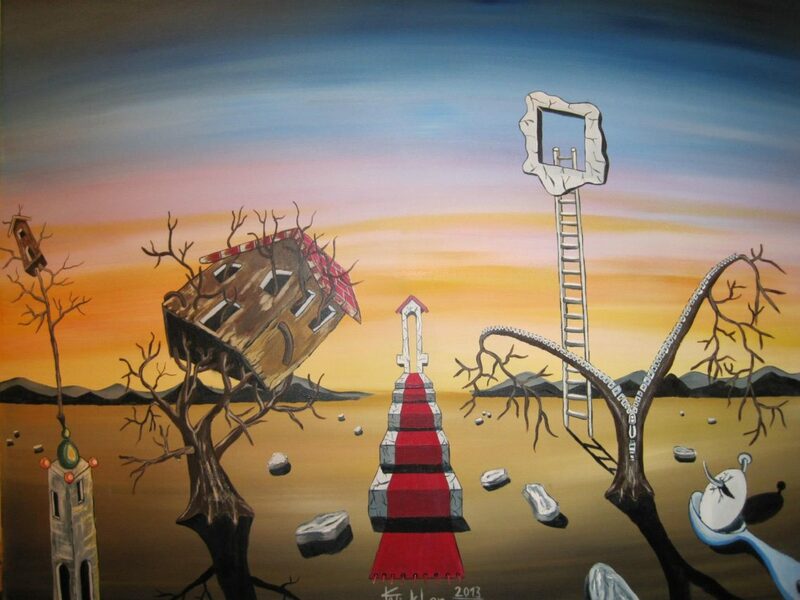 I really like the sound of Karls work and to me it seems like a cross between surrealism i.e. Salvador Dali and a reference to cubism too! Stunning and thought provoking art. The best kind. I wonder if I can see any of his work closer to me. The work of art of K. Winkler is so outstanding. I am so in awe of his work. My question would be why he is not MORE famous! Hats off Mr. Winkler. You have a talent I have not seen in a long time. One day in my chemistry class we watched documentary about water and how her structure is always different even though it molecules are always H2O. Then it got to a point how water’s structure is when you play classical music. It was so beautiful. Even though I listen to rock, but the water’s structure when you listen rock is not so beautiful, to say at least. So I plan to play classical music to my children as well you do. When it comes to art, I love paintings, they always got me into thinking. I really like the pieces of Karl Winkler inspired by Salvador Dali. Great art!! Such a creative artist Karl is.!! Seriously the pictures are too good and the video is also cool. I too started doing a bit of painting hope I’ll get a good hands on it. He is incredibly talented! 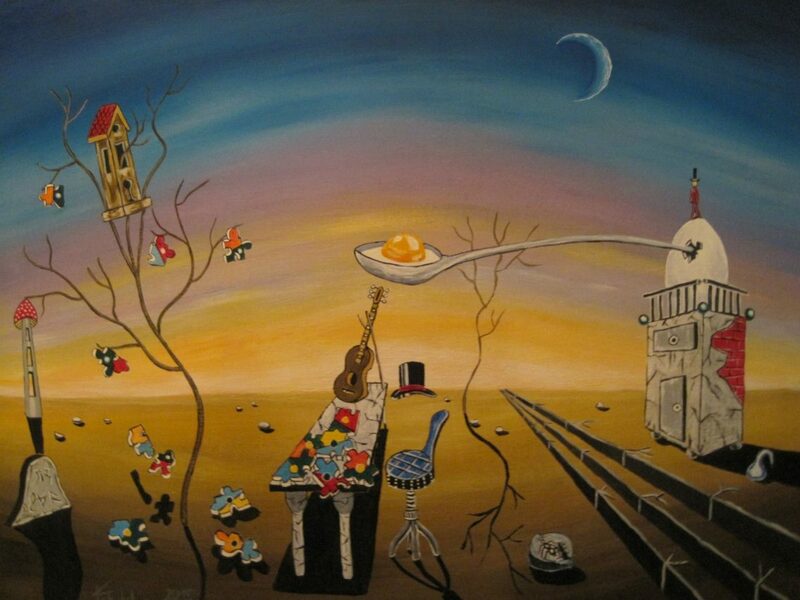 I can see Dali in many of his paints, he might has been inspired by Dali’s art but he give us a new perspective! As I love to do paintings being an artist, I always love these kind of information. I was not knowing much about Karl Winker, but your post have made me inspired by him more. His paintings are really a puzzles. It is the most awesome feeling when you connect to an artist. We feel the same about Jenny McGee! What a creative soul you’ve found in Mr. Winkler and to catch a glimpse of who he is makes it even more special. I love that you’re sharing these experiences with one another to bring visions to your words and imaginations. We have a local gallery in the town I grew up in, now I’m inspired to take a summer evening visit and see what I discover. Thank you Sheri. Wow what a talent! 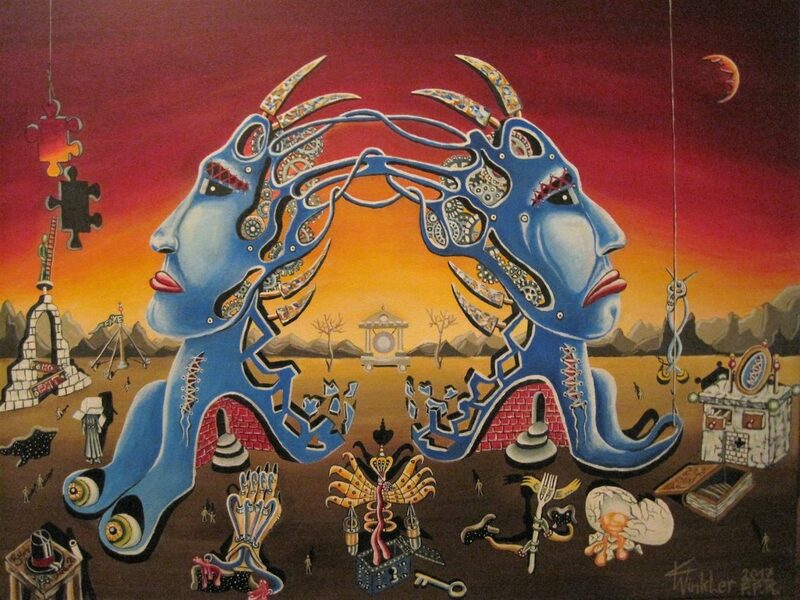 I love his art work, and completely see the comparison to Dali, this is definitely the kind of art work that I would display around my home. Hi, I have to confess to not really being an arty person. These works are quiet quirky to me but what do I know. Love that your little one likes classical music. Wow I never heard of this artist but his work is breathtaking! WOW. How cool. I’ve never seen the work of a modern surrealist, or an artist so deeply influenced by surrealism. Thank you for sharing his work. I look forward to seeing even more of it. What fantastic art. I love kind of art too and I have a several beautiful art painting that my hubby and I has bought in Bali and Thailand. And yes, I love dance too, I believed that dance is also kind of art that shows beautiful body moves. I really enjoyed this pictures. These are some very unique art pieces. My husband and I were thinking about doing an art date where we go when we paint together as a couple. That’s a great idea Saidah! I would love to do that, as well as join a pottery class. Hi Journa, that is nice to hear. Where did you hear about him? I agree with the fact that he is very talented! I really like this post because I am a creative person. I have attended an art gallery and a few museums in my life time. They are always a lot of fun because you get to experience a lot of different pieces of art at one which can shape you. For my own art, I would say that I try to do something new. I don’t draw or paint as much as I would like. I do enjoy it thought when I get the chance. What stunning art, I love the nods to Dali’s work it makes the work so inresting to stare at, you’ll always find something new! Thanks for sharing a new artist for me to love.